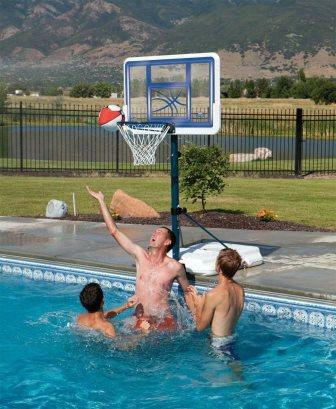 Enjoy hours of fun on those hot summer days splashing around with a pool basketball hoop! 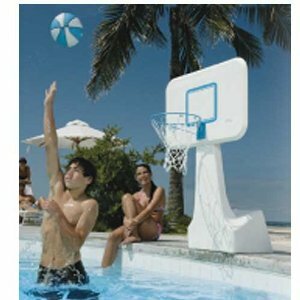 Parents and kids alike will love playing swimming pool basketball games with these goals and accessories. Choose between poolside, in-ground, and floating goals. 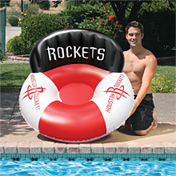 And find some fun NBA-themed pool accessories! It doesn't matter whether you have an above-ground pool or an in-ground swimming pool, there are plenty of pool basketball options for you to choose from. 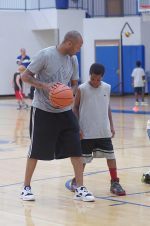 Portable basketball goal with a 44" acrylic backboard, telescoping pole that adjusts height from 4.5'-7'. The base has a 26-gallon capacity that can be filled with water or sand, and it is mounted on wheels for easy moving. Heavy duty, commercial grade adjustable goal with a super wide backboard (44" x 32") and large base that fills with water for stability and support. Regulation-size metal rim with heavy duty net. Goal attaches to an aluminum anchor on the pool deck with a cap to cover the hole when the pole is removed. 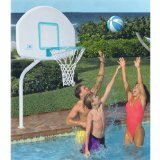 The net is regulation-size with a large 43"x 29"backboard that sits 46" above the pool deck. 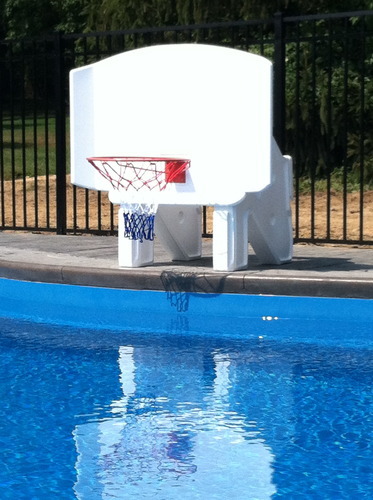 The rim has a 20" overhang so players can avoid banging into the side of the pool. 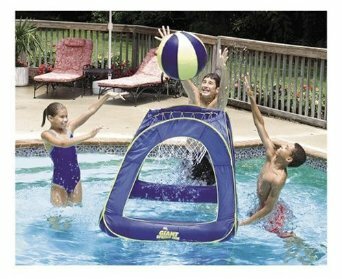 For those that also like water volleyball, you might be interested in a pool basketball hoop/volleyball combo set that allows you to convert the legs of the basketball goal to standards for the volleyball net. There are different styles for in-ground and above-ground pools. These monster-size goals are inflatable. 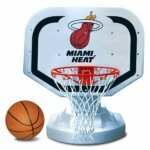 Are you an NBA fan? Poolside goals with the logo of your favorite NBA team imprinted on the backboard. When you're ready for a break and just want to float around for awhile, sink into a luxury raft. 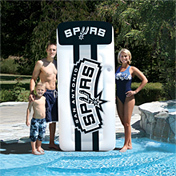 Catch a little sun on a huge NBA float that measures a whopping 83" x 37" deflated and holds up to 300 lbs. 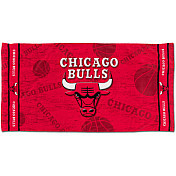 When it's time to get out of the pool, dry off with a colorful team towel. So, what are you waiting for? 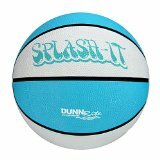 It’s time to slam dunk and get wet!